Alexander the Great of Macedon (356-323 BCE): Learn all about this famous and powerful Greek conqueror, whose empire stretched as far as India and northern Africa. 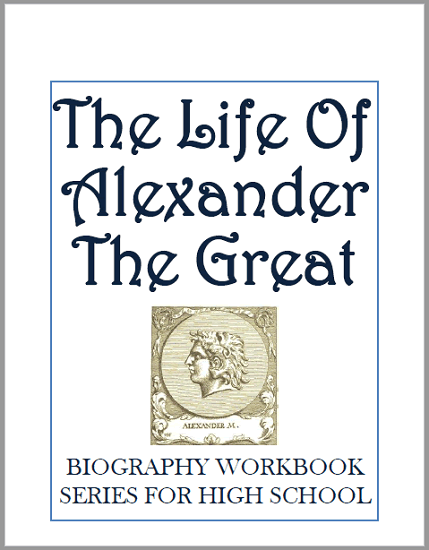 Part of our Biography Workbooks series for high school students, this item is eleven pages in length and full of cross-curricular activities and questions. Click here to print. The answer key is below. Answer Key: 1. Answers will vary; 2. B - Aristotle; 3. A - Antipater; 4. I - Pella; 5. J - Philip of Macedon; 6. L - Thebes; 7. E - Gordian Knot; 8. H - Olympias; 9. G - Hellespont; 10. C - Battle of Chaeronea; 11. B - False; 12. A - True; 13. Answers will vary; 14. Roxana, the daughter of Oxyartes; 15. Bucephalus; 16. A - True; 17. B - False; 18. Babylon; 19. Alexandria, Egypt; 20. Answers will vary; 21. Answers will vary; 22. Answers will vary, but might include "Rudolf of Ems," "Alexander," and the Koran; 23. D - Ukraine; 24. On map; 25. On map; 26. On map.